Welcome to Chocolate Friday! 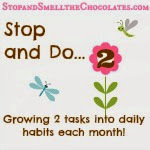 I have a guest poster today to bring you chocolate while I am away on vacation. It's Melissa from Frugal Creativity. 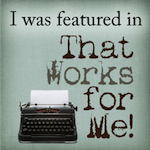 Melissa is a newer blogger and I'm so glad I found her blog! She's a mom who enjoys cooking, papercrafting, cardmaking, baking, and other creative endeavors, but all while she's on a budget! Fun and helpful at the same time. And she likes chocolate, which seals the deal of course! Thanks for helping out Melissa! One of my family's very favorite Christmas cookies is this Chocolate Raspberry Crumb Bar. For summer, though, I was looking for bar cookies that were a little less decadent. 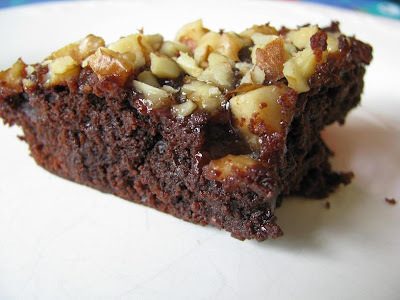 I turned to my Hershey's Homemade cookbook (copyright 1991 and still available at Amazon.com) and found this recipe for Chocolate Chunk Raspberry Bars. I made only one change: I used the microwave instead of the stovetop for heating the sugar-butter-water mixture. In fact, I mixed the entire batter in a 2-cup Pyrex measuring cup, so I didn't need to use a bowl at all. Next time I'd use a 4-cup measuring cup so there's a little more space for stirring. Heat oven to 350F. Grease 8-inch square baking pan. In a medium saucepan, combine sugar, butter, and water. Cook over medium heat, stirring constantly, until mixture boils. Remove from heat; immediately add 1 cup chocolate chunks, stirring until melted. Stir in egg and vanilla until blended. In a separate bowl, stir together flour, baking powder, and salt; add to chocolate mixture. Stir in remaining chocolate chunks; spread into prepared pan. Place pan in freezer 10 minutes. Stir raspberry preserves to soften; spread over chilled batter. Sprinkle chopped nuts over top. Bake 35 to 40 minutes or until brownies begin to pull away from sides of pan. Cool completely in pan on wire rack. Cut into bars. Makes about 16 bars. The raspberry flavor intensifies in the oven. I cut the first bar while it was still warm, and I don't recommend that! I cut these into small triangles--about 32 for the whole pan--because of the intense flavor. Thanks again Melissa - wiping up drool right now! Now it's your turn to link up some chocolate posts right here. Share the chocolate - please!! Those look pretty delicious! YUM! Big Chocolate Chunky Hugs to you! 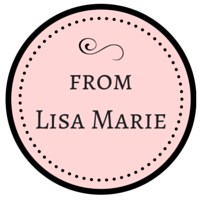 Thanks for the opportunity to guest post, Lisa! I don't see a Mr. Linky but my vacation connection is super slow. I'll place my link here for WW Chocolate Chip Cookies! Raspberry and chocolate = a winning combination. I can't wait to try them! I don't see Mr. Linky either, but I wanted to share a new recipe we tried last month that was so yummy we made it again this week - Chocolate Peanut Butter Ribbon Dessert. Hmmm...don't see a Mr. Linky. 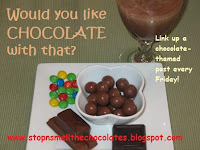 But here's my post on chocolate. And a giveaway! I didn't even know about this chocolate blog. This could be the death of me. As usual, this recipe sounds great!